We get it. You only watch golf four times a year. The Masters, both Opens and the PGA Championship. Maybe you throw in The Players Championship or Ryder Cup some years. You are sort of aware of what's going on at the other tournaments and what has happened in majors of the past but not totally sure. That's why I'm here, to provide you with a root-ability guide to this year's U.S. Open at Oakmont. These are players and stories that can get the entire family on board. The hall-of-famer looking for the last piece to that career slam? Check. The beleaguered uber-talent looking for his first? Check (and check). The all-American looking for two in a row? Check. The only condition is that they have to be actual contenders for the title and not just a random amateur who has no real shot at winning. Here are the top nine. 1. Dustin Johnson: You all know the story by now. Johnson hit two of the greatest shots in U.S. Open history last year on the 72nd hole before three-jacking with the flat stick to miss out on a playoff with Jordan Spieth. Redemption would be sweet at Oakmont for his first major championship. "Dustin is explosive," No. 6 on our list Jim Furyk told Sports Illustrated recently. "It's been a lot of just not knocking in putts at the right time. It could happen soon, and when it does, he could be off to the races and win three majors in four or five years." 2. Phil Mickelson: Talk about beleaguered. Mickelson has six runner-up finishes at this tournament (and he's won the other three majors). Gives some definition to "always a bridesmaid." Mickelson even acknowledged this after finishing second at the FedEx St. Jude Classic on Sunday. "It almost feels like U.S. Open came a week early to finish another second place," said Mickelson. He turns 46 on Thursday during the first round. The last leg of the career grand slam would be a sweet present. 3. Jordan Spieth: The term "embarrassment of riches" comes to mind with Spieth. He's one shot from having won three of the last five majors. As it is, winning Oakmont this week would be three of the last six, including two U.S. Opens. So why is he this high up on the list? I love legends and Spieth, at the age of 22, would be entering territory traversed by only Tiger Woods with another major win at this age. 4. Sergio Garcia: I'm a sucker for the "talented superstar can't get over the hump and nobody thinks he's as good as he actually is because of it" narrative. Garcia is pretty much the definition of that mantra. His makeup doesn't exactly scream, "has the mindset to go 72 holes at the nation's toughest course," but how cool would it be if Garcia was finally able to get his first major at the hardest place to do it? 5. Rickie Fowler: A win here would truly legitimize him as one of golf's supernovas. Fowler has interestingly become as likable to the masses as he is intriguing to kids. From his Snapchat stories to his even-keeled nature on the course, he's about as easy as it gets to root for athletes in the overexposed era that we're in. None other than Brandel Chamblee agrees. In the TV world that I now inhabit -- where we the media ask so much of the players -- social media, the Niagara of undiluted criticism, invites a hell's stew of haters into their lives. Jason Day,Martin Kaymer, Rickie Fowler, Adam Scott and Lee Westwood pass every test with an enviable civility. 6. Jim Furyk: Furyk was born in Pennsylvania and has expressed his desire to specifically win this tournament at this course before. He nearly did it in 2007 when he finished T2 with Woods behind Angel Cabrera. "If I've had five events in my career where I really felt like I let one slip through my fingers, that's one that bothers me," Furyk told PGATour.com about that tournament. "For that to be a major is a little bit more disappointing. For that to be real close to home is even more disappointing." 7. Jason Day: Day led after 54 holes last year even as he suffered with vertigo throughout the trek through the gravel mine that is Chambers Bay. He's the No. 1 player in the world and an easy one to root for at that. The last No. 1-ranked player to win the U.S. Open? How about Woods in 2008. 8. Rory McIlroy: The argument that McIlroy's best stuff is the most thrilling ride in the sport is an easy one. 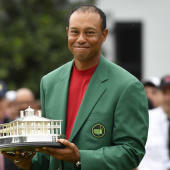 He would pull ahead of contemporaries Day and Spieth with five major championships and add to his legendary list of courses conquered (Royal Liverpool, Congressional, Kiawah and Vallhalla currently). The only reason to root for him is because the four-day roller coaster would be fun as hell. 9. Branden Grace: He gets lost in the fray from last year. All the attention was given to Johnson and Spieth (deservedly so), but it was Grace who first blew a chance at winning that tournament on the 70th hole. Spieth followed him with a double bogey at the 71st hole and Johnson with the three-putt par at the 72nd. It would be pretty cool to see Grace given another chance this time around.